Today, we are going to give you all the information you need about the best patio doors, whether you should repair or replace your patio door and how much it costs to repair a patio door. We’ll also discuss the two major components, which are the sliding patio door track and the sliding patio door rollers. Patio door repairs or replacement – Which is better? By far the most frequently asked question we get on the phone when discussing the options of patio door repairs with a customer. We get this question so much we created a video answering it. Click play on the video below to see the answer on repair or replace. Bottom line is this. The quality of your door will dictate the extent of the damage. In 99% of cases, it will always be cheaper to repair rather than replace your existing patio sliding door. We’ve repaired thousands of patio doors over the last 25 years and as a general rule, the aluminium frames stay intact. We get to work on the sliding door tracks and the sliding door rollers. 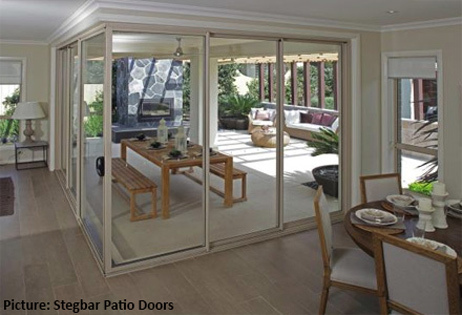 Another common question with patio sliding doors is ‘How do I fix patio doors that have dropped?’. There are a number of issues here but our first priority is your family’s security. When we do patio sliding door repairs, we make sure your locks line up perfectly. The main culprit to sliding patio door lock problems is failing internal components. Often a number of the springs have gone due to old age, the rollers are brittle and broken in places and key pieces that hold the door at the right level have given way. The good news is, we fix all of this and use the highest quality parts across all door types. We’ve been fixing sliding doors for over 25 years and stock all major components in our van. That’s how we are able to be so efficient in our patio door repairs. There are more than 40 common sliding door brands that we’ve been fixing for the last 25 years. Every door is slightly different has different internal components and requires specific springs and rollers to get the job done correctly. Our team is experienced at repairing all types of patio doors and stock the parts needed for your door repair. Be mindful that the DIY route or hiring a ‘home handyman’ is often an expensive way to go. We take many factors into account with your door repair, so be sure to check out our sliding door repair video page to learn more about our process and diligence when repairing your doors. The cornerstone of a rock-solid door repair is the quality of the rollers. 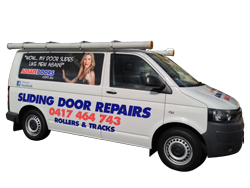 We have relationships with Australia’s premier sliding door roller companies, which allow us to offer you an extended warranty on all our door repairs. We’ll even show you the difference between your old rollers and our new rollers. Given our experience, we weight your door and ensure the best roller for your door weight goes in there. Another key area for your door repair is the track. Over time, your track will become chipped, damaged and in many cases, it breaks away. We machine your existing track back to a stub and then put a new stainless steel capping over the top. Click play on the video below to see our process of machining and then installing a new track, which lines up perfectly with your new rollers. As mentioned above, there are over 40 common sliding door brands we are able to repair. If your patio door is hard to open and you are in need of a patio door repair instead of a replacement, then give our team a call today. We will ask a few specific questions about your patio door including the brand of door, the issue you are having and a few others and give you a quote on the phone. You will be confident in the knowledge that when we fix your patio door, you will be able to open and close it with one finger, guaranteed.